I did the first version of this a while back, and a second version too. But I had a few small changes, and after chatting with Matt, I thought I would update the article. 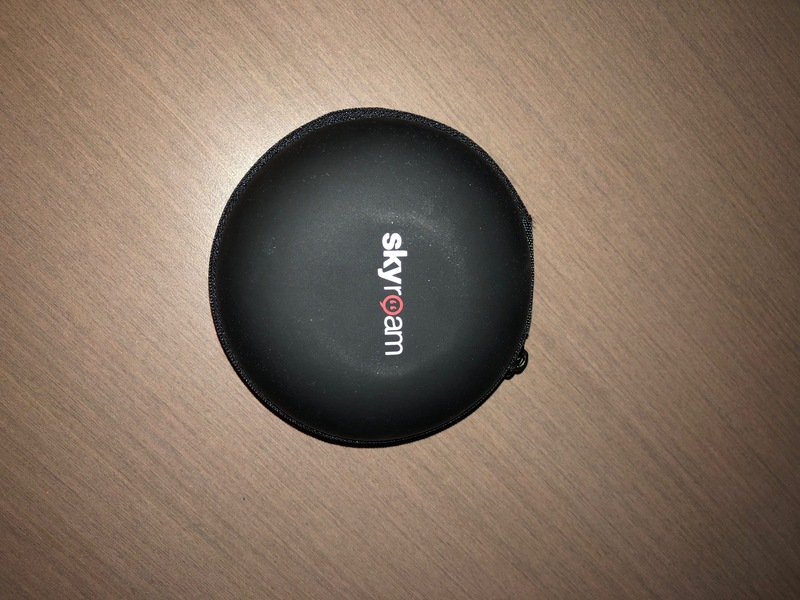 I should also mention that all of this is always in my bag – except for the Bose headset, and Skyroam that is. Why do I use it? First my wife suggested that as I wear suits sometimes (not much anymore but in Asia) that I needed a laptop bag that would at least sort of go with the suit. This one – she mentioned, does. It was expensive (350 US$) but it has lasted a long time – 7 or 8 years – and still looks good. Not for sale any longer unfortunately. I also like how it doesn’t expand so there is a finite amount I can carry with it! We can see a pen, and an Apple Pencil, and my cable management kit. There is also a USB stick, and a very nice hook to hook my house-keys too. The single USB stick has been replaced, or rather added to now due to the different ports in use. The small thing is a USB to USB-C. 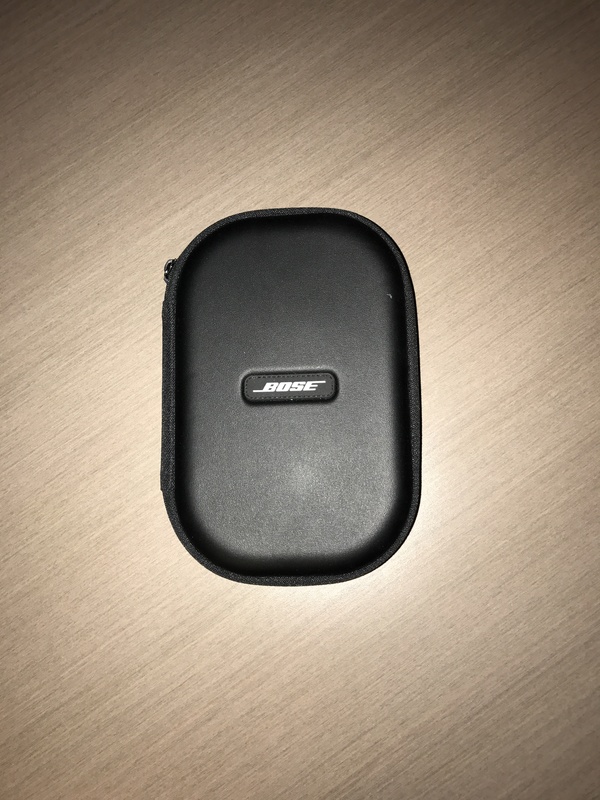 I found it at Amazon.ca and it works well – for example with the pointer below, or the USB stick above. Guess what the cable management kit contains! The power brick is now a 30W one that does a very fast charge for iPads, and iPhones. 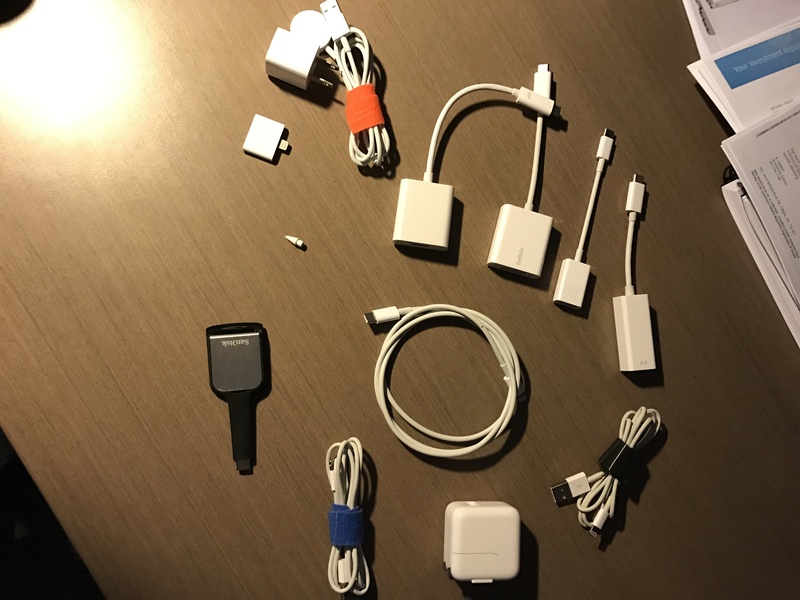 All of these dongles are from Apple. If we look at the outside bottom pocket we see different things. 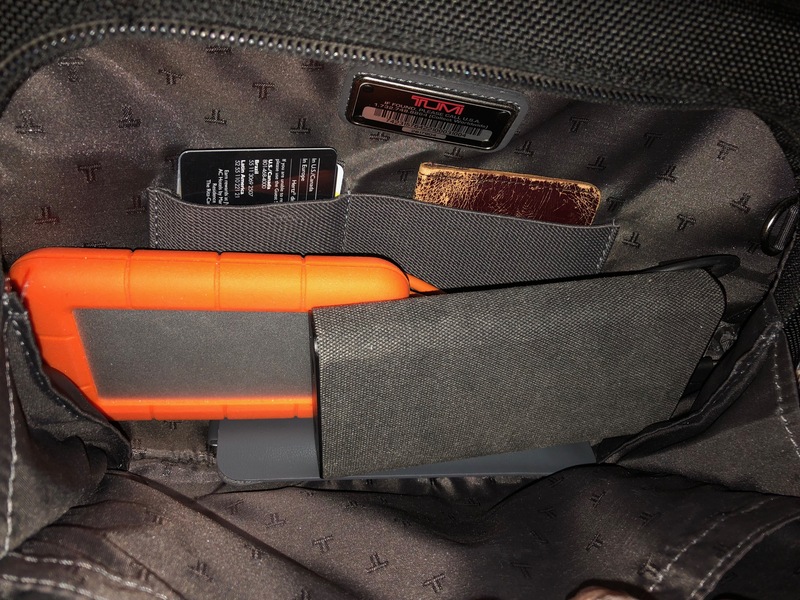 There is the Lacie rugged external disk with USB Type – C connection. And yes, water resistant and shock resistant too (and orange). It is 2 TB and carries a lot of different things – ISO’s, videos, images and more. I have another one of these in my suitcase I do image backups to while on the road. Mophie battery pack. A very powerful battery that I have used to help my MBP along and do a bunch of charges on my iPhone and iPad. It is USB-C, or USB. 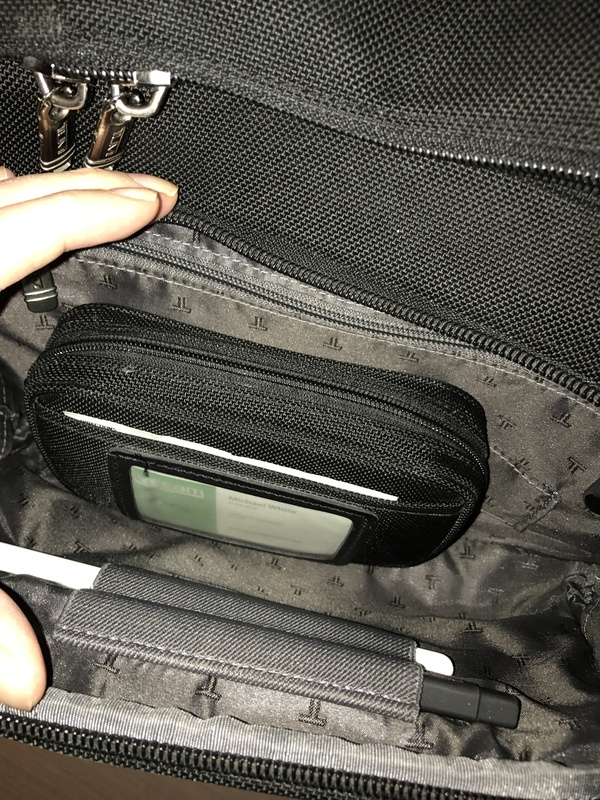 I cannot find where I bought it, nor anything on the Mophie site that it matches. I really like my Goal Zero battery but this one is not much heavier and can do a lot more charging. The long and narrow black thing is a clicker for presentations but it also allows you to expand – or blow up – a section of your preso which make it work better than a laser pointer. Works very well with Mac and PC. It is called Logitech Spotlight Advanced Presentation Remote. The white thing is my AirPods and I really like them. The battery life is excellent and sound is very good. I love how you can pull one out and it pauses things, or you can talk with Siri with them to do things like send or read messages or change the volume. 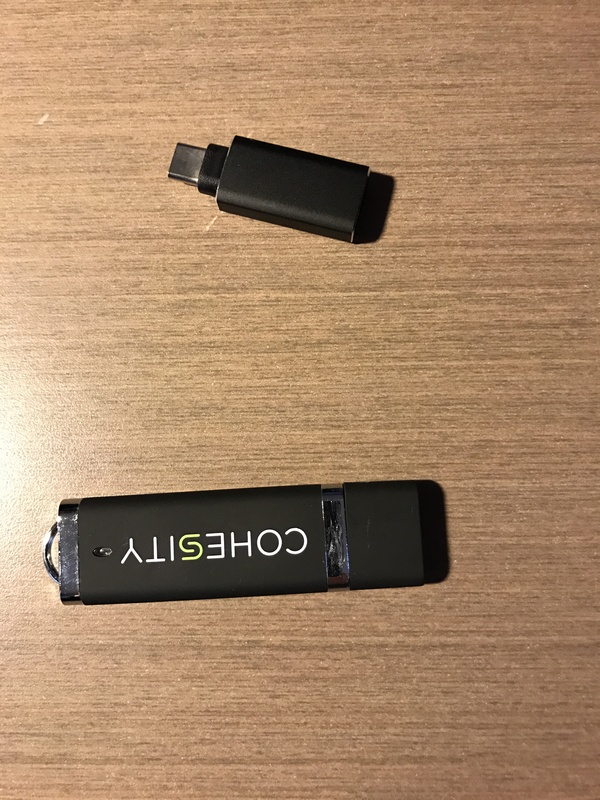 By updating this article, I discovered I have one extra USB-C cable in this. Good to dump! 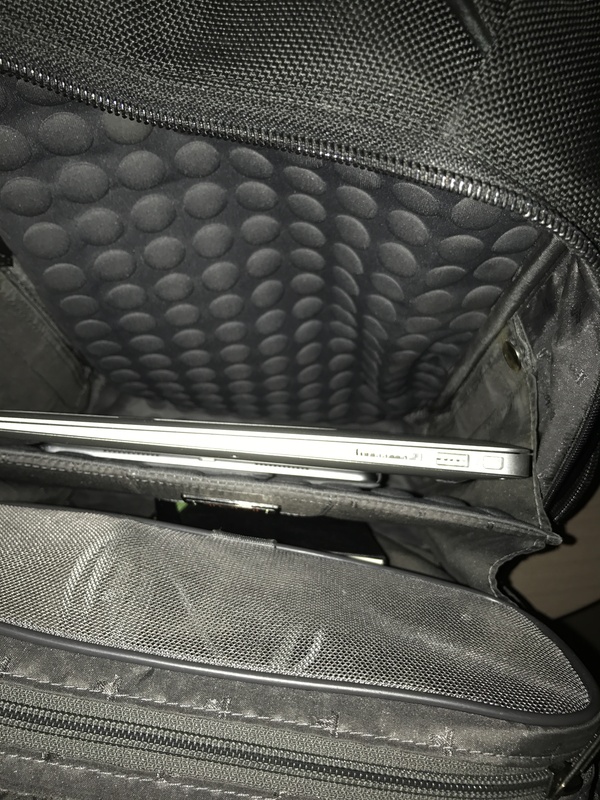 We see my MacBook Pro (2017 15″ with Touchbar and TouchID), and while you do not see the power adapter it is in fact in the bag. My iPad Pro with the Zagg Rugged Messenger 7 Color Backlit Case and Keyboard. I normally use the Apple keyboard, but my wife broke hers and so she has mine. This rugged one is the one I take into the desert, mountains or to Africa. But it works in the office too. So for trips around town this is it. But when I travel outside of town I have one other thing in the main compartment. 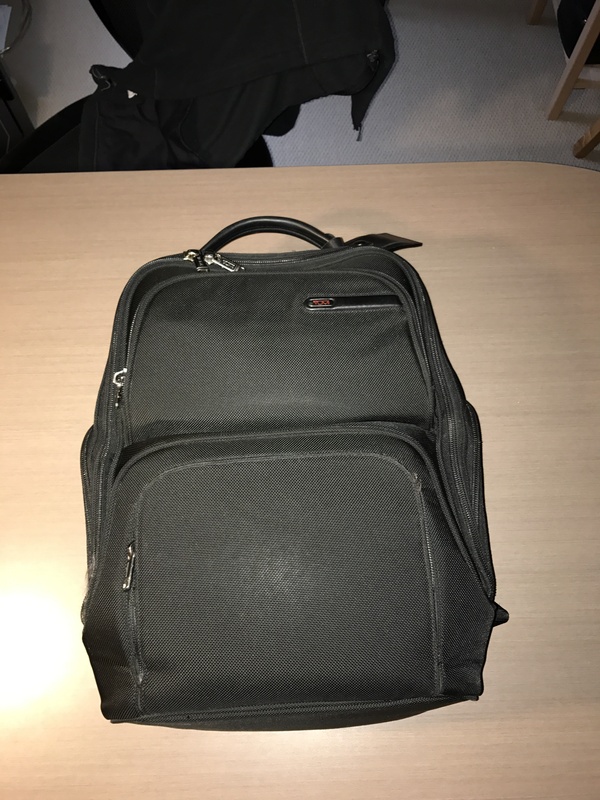 I also have another thing someone in my bag when I think that I might have troubles with connecting out of an office to my home lab. This little hockey puck sized Wireless access point works almost anywhere. It is from here. It seems to work pretty good and doubles as a battery too. So, you know what is in my updated laptop bag now. I should add that in my suitcase I have another rugged drive like above to do backups too. 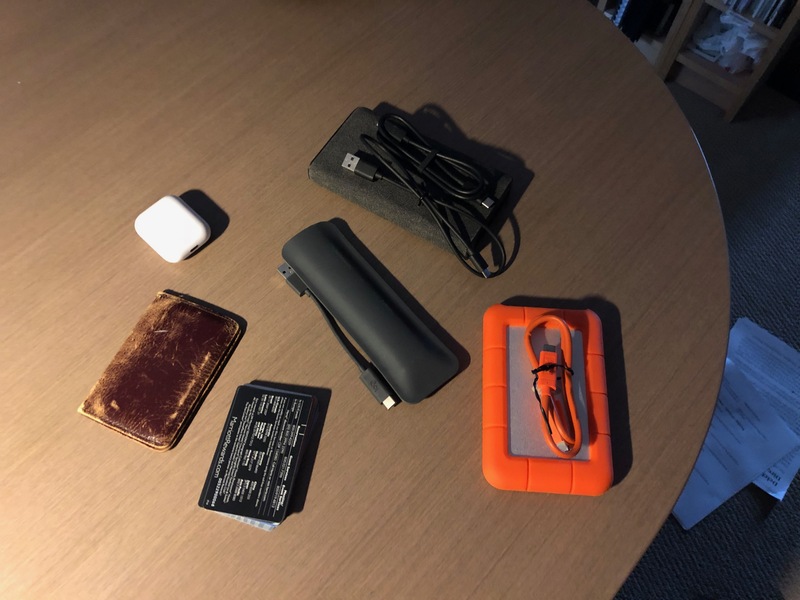 I also have some charging cables so I can have a charging station in my room but leave the charging cables in my bag in case I need them while out of the hotel room. I also have a couple of cables that let me connect iPad or MBP to TV’s, and a very nice Bose speaker. 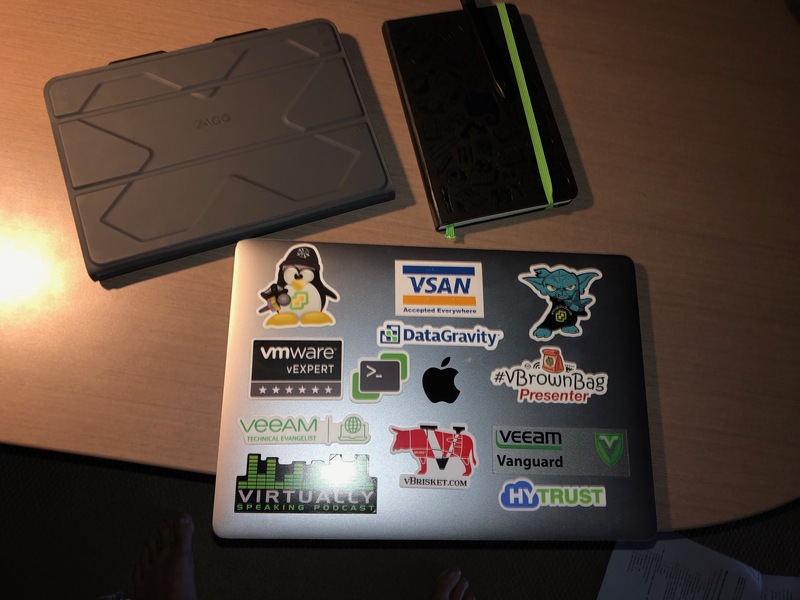 Next Post What software do I use on my MacBook Pro – 2018?